I'm a new member, and have been searching for info on diffs for days now. I've read a lot about ratios but haven't found any info on the stamp on the underside of the diff to determine what I already have. 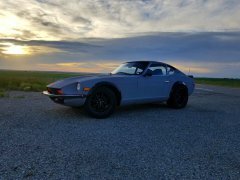 I have a 75' 280z with a real long feel to the gearing. The stamp on the under side of the diff is # 157 37X KN3. I also have a diff out of a 78 280Z with the #R22. I`m not sure of the history of either car lol! I should also mention I identified both my five speed transmissions as a close ratio since they have one ear instead of two. My is however to install a shorter rear end , since I`m running 2750 rpm at 75 miles an hour, and my first gear seems to be kinda gutless. Is the R22 shorter, and is there any benefit to sticking with the diff that`s in the car now? the stamping on the outside is fairly useless in determining what diff you have. their is a big size difference between the r180 and r200. you need to determine what gear ratio they are, as for the which one will benefit you more, thats entirely up to what you use the car for. The only way to be accurate is to remove the rear cover and read the stamping on the edge of the ring gear (real simple with cover off). You probably have a 3:36 or 3:54 R180 in there now (hence the low RPM numbers) and need to pick yourself up a 3:7 or better yet, a 3:9. If you do indeed have a R180 now, you will want to try and find another R180 or end up having to change out some parts to fit a R200 in there. All that info is in the drivetrain section/forum. Which transmission do you have? Those mph/rpm numbers look very similar to my T-5/3.54 setup which I'm a fan of for highway driving. It doesn't take too long to pull the rear cover and it's the best way to ID one. It will have the teeth numbers stamped on the ring gear on the outside edge near the mounting surface. Once you figure out what ratio you have and what you'd like to get, just go to the diff stickey in the drive train section to figure out what car to pull a diff from to get what you'd like. Just get a piece of chaulk and mark the output flange and count how many turns of the driveshaft it takes to make one turn of the output flange, easy to ballpark what you have without getting that nasty hypoid oil all over the place. I drove my 280Z with an unidentified 5 speed (I think it was early 280ZX but I'm not positive, maybe later ZX) and a 3.54 R200 and it had a busted speedo cable for four years. I had my speed by RPM figured out pretty well, and at 2750 in fifth I would've been doing 65-70. My guess is 3.36, but as posted above, mark and rotate while counting. That (or opening the case and counting) is the only way to be sure.